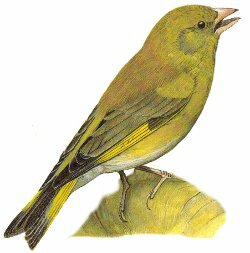 The Greenfinch is a large heavy finch, mostly green to yellow coloured with a distinctive yellow wing bar. Common resident breeding bird in most of Europe, a summer visitor to Northern Europe. A bird of farmland, hedges and woods, likes areas of large gardens and orchards. Avoids areas of higher ground. 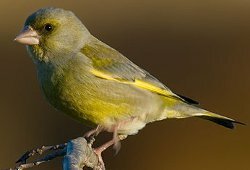 A large heavy bird, the male Greenfinch in summer is a striking bird easy to identify, females and males in winter are much duller and not so distinctive. 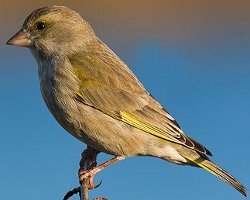 UK numbers have recently been drastically reduced due to Trichomonosis, a disease which the Greenfinch is particularly susceptible to and can be caught from dirty bird feeders. This male Greenfinch is showing his bright summer plumage, note the grey colouration of the neck and head, also note the striking yellow flashes on the wings and the heavy bill. 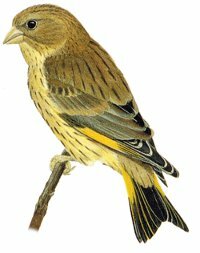 The female Greenfinch is similar to the male except she is much duller, however in winter the male also becomes much duller making it difficult to distinguish sexes. Juvenile birds in mid-summer can cause confusion, they are much browner than their parents and lack the yellow rump, they have diffuse streaking across their entire plumage, however they still have the yellow flash on their wings and tail which coupled with their size should confirm identification.